The vast array of handcrafted products displaying intricate Gujarati art forms are not only popular in our country, but are a well-known entity all across the globe. These products include furniture, jewellery, embroidered garments, leatherwork, metalwork, baked clay articles and mirror work. Gujarat serves as the producer of some of the most creative and elegant furnishings that include bedcovers, quilts, cushion covers and table mats. Preserving the glorious legacy of its past, the garment industry of Gujarat provides a broad range of items to the buyers, namely salwar, kurtas, cholis, ghaghras, odhnis, skirts, and jackets. Intricate dainty patterns are woven on the patola sarees with high precision. The traditional art forms of the state play a significant role in preserving its rich heritage. Some other aspects of art include music, dance, and literature. The folk music of Gujarat is known as Sugam Sangeet and has acclaimed world-wide fame. The range of musical instruments utilized in Gujarati folk music includes turi, manjira, ektaro, jantar, zanz pot drum, prabhati, dhol and ravan hattho. Bhajans are also incorporated in their folk songs. Bardic tradition is another major type of folk Gujarati music. 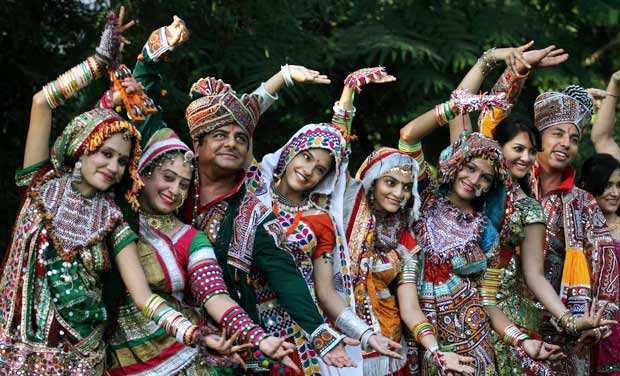 Since Gujarati people are quite enthusiastic and amiable, they have many traditional forms of dance. The four major forms of dance are Dandiya Raas, Garba, Padhar, and Garbi. Dandiya Raas is performed by both men and women and utilizes movement of bamboo sticks, known as Dandiyas. It has ancient roots and was believed to be played by the beloved Gopis of Lord Krishna. Garba is usually performed by the females in a circular formation. It is performed with reverence of the feminine form of the divinity. Garbi is traditionally performed by only the men and incorporates the use of instruments like dhol and manjiras. Padhar is mainly performed by the rural communities near Nal Lake. Due to many religions coexisting in the state, Gujaratis believe in various Gods and Goddesses. Embracing different religious faiths, Gujaratis demonstrate a vibrant mix of Hinduism, Islam, Jainism, and Buddhism. This amalgamation of cultures is quite evident in their beliefs, customs, traditions, institutions, and practices. The natives display a balanced lifestyle due to the perfect system of learning, a blend of religious practices and the development of artistic traits. The cow is considered the mother God and hence worshipped devotedly by them. The majorly celebrated ceremonies of Gujaratis include birth, thread ceremony, marriage and death. All the rituals are performed by the highly ranked Brahmans. Although Gujarati is the mother tongue of the natives of Gujarat, many other languages are widely spoken throughout the state. Gujarati is an Indo-Aryan language derived from Sanskrit and is the 26th most widely used language in the world. Gujarati has about 11 different dialects, spoken in various parts of the state. Since the state of Gujarat shares its border with Maharashtra, Madhya Pradesh and Rajasthan; a small section of its population speak the native languages of the neighbouring states, namely Marwari, Marathi, Hindi along with Urdu and Sindhi. The natives of Kutch-a semi-arid region in Gujarat-speaks Kachchi language, which is quite an important language of the area. 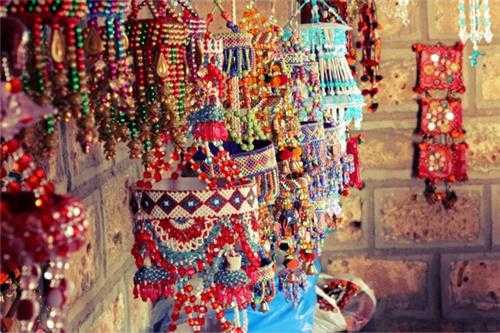 The fairs and festivals of Gujarat showcase the real vibrancy and colours of its diverse culture. 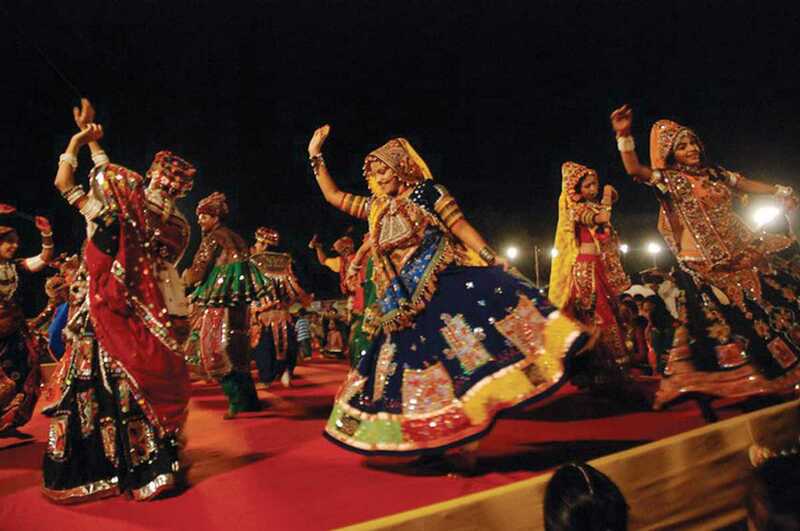 Thousands of people flock to Gujarat to witness the extravaganza during festivals like Navratri Mahotsav, Deepawali, Rathyatra and Kite festival. There are some fairs as well that are organized in the state every year, namely- Shamlaji Melo, Bhadra Purnima Fair, and Mahadev Fair. These occasions lure visitors from all across the globe and increase the tourist footfall. The Rann Utsav is a major festival and witnesses an exquisite carnival of music, dance and natural beauty. A traditional and authentic Gujarati meal consists of dal, roti, rice, vegetables, salad, chaas, farsan followed by a sweet dish. 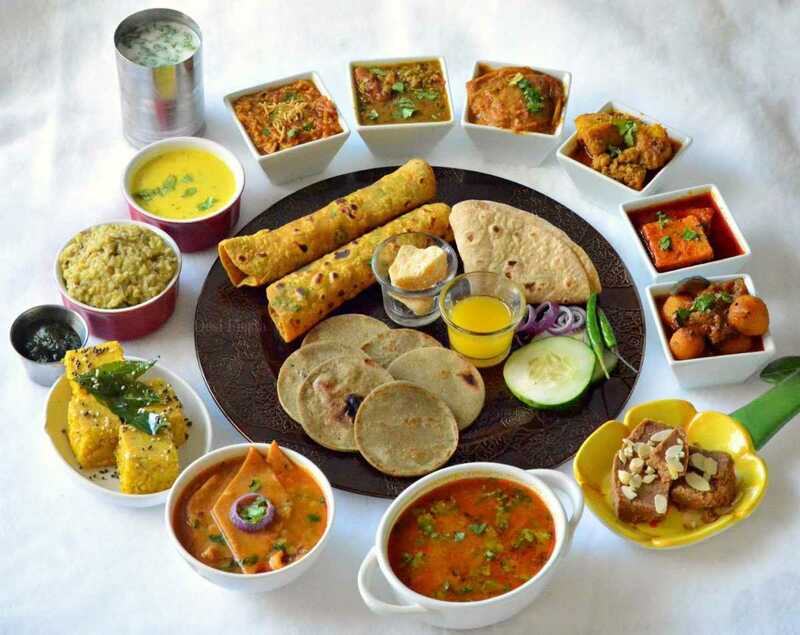 Gujarati cuisine is quite similar to that of Maharashtra, and most of the Gujaratis are vegetarian. Some of the famous Gujarati delicacies include dhokla, fafda, khandvi, dhal Dhokli, Undhiyu, handvo, Ganthia, dal Wada, khakhra, and Thepla. In Gujarati dishes, the flavors are a blend of sweet, spicy and sour tastes. Each region of the state has a distinctive flavor associated with its local food. A typical Gujarati dinner includes bhakri-shak or khichdi-kadhi. The Gujaratis are noted for their sweet tongue, and hence every meal is followed by a sweet dish or sometimes even jaggery. Patola Silk or popularly known as 'Queen of all silks' forms a major part of traditional Gujarati attire. Gujarati brides are adorned with silk and zari woven sarees of Gharchola and Panetar. The traditional attires often incorporate tie-dye or traditional block prints. The region of Kutch has a distinctive traditional outfit adorned by women known as Abhas. Chania Cholis are a popular choice of outfit during the festive season of Navratri Mahotsav. Men also wear unique attire known as Kediya dress during the Navratri season. Also, a prevalent Gujarati trend is the silver Pachchikam jewellery that originated in Kutch. Just like other elements of the Gujarati culture, their wedding ceremony is as elaborate and exciting. With multitudes of ceremonies each with its own significance, sometimes the bride and groom await the marriage ceremony more than the marriage itself. The engagement ceremony or the 'Gaud Dhana' translates to jaggery and coriander, which will be distributed to the guest. After the exchange of rings, the ceremony ends with the bride's family gifting the groom a box of sweets to represent a sweet relationship. The wedding ceremony in the Gujarati culture is probably the most awaited event for the couple and its family but for all the guests as well. Like every Indian wedding, the rituals go back to the Vedic times, and the ceremonies kick off with the (Varghodo) wedding procession, that goes from the groom's house to the bride's house where the ceremonies take place. On arrival, the groom is welcomed by the bride's family (Swagatam) after which the bride's father performs a ritual involves him handing over his daughter to the groom (Kanya Daan) in front of the guest. After this, the rituals (GaneshPuja) commences, this is known as the Vivaan. During the Vivaan, the couple performs the Mangal Phera where they go around the sacred fire and go through the most important part of the ritual, the Saptapadi or the seven sacred steps. 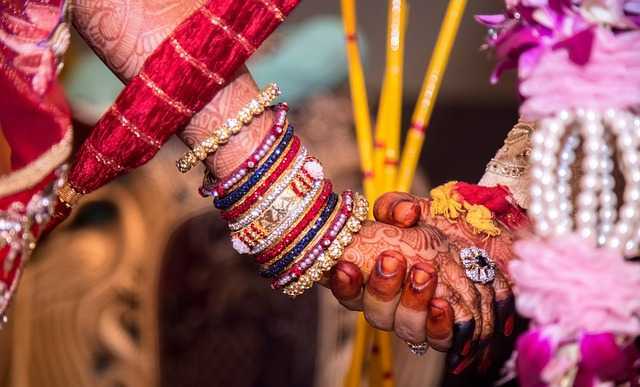 The religious part of the ceremony comes to a close with the holy thread (Mangalsutra) being tied around the neck of the bride by the groom and he places the red dot (tika) on the wife's forehead, as a declaration of her new married status (Suhaag). The ceremony comes to a close when the couple goes to the groom's parents who will bless the couple (Aashirvaad). With strong themes of mythology, history, social and political, the Gujarati cinema industry is different with the approach they have to cinema. Before the industry came into being, during the era of silent movie age, there was already a hoard of movies made on Gujarati culture and its people. More than just a means of entertainment, the Gujarat film industry brings in various forms of cinematic art. A trip to the cinema is a favourite past time amongst the Gujarati locals. 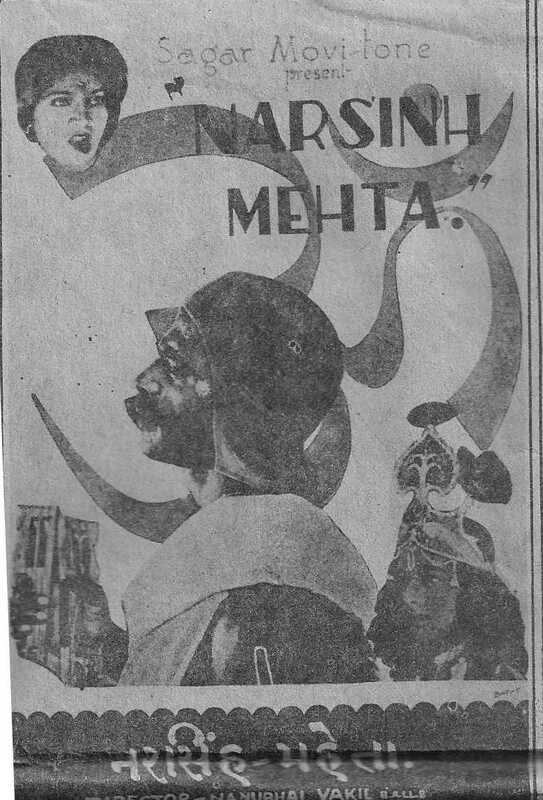 Also known as 'Dhollywood' or Gollywood, the industry released its first movie in 1932, Narsinh Mehta. The Gujarati community has well preserved their rich traditions and customs that have deep roots in their past. The mingling of the diverse ethnic folks has resulted in a well-balanced community that displays significant qualities like friendliness, liveliness, unity and immense love for their various ancient art forms. The plethora of traditions along with a tinge of modernization sums up the culture of Gujarat. Food of Gujarat - Gujarati Dishes You Can Treat Your Tastebuds With!